In the comfort of her home on Friday, February 26, 2016, Eva Kraus (nee Viravska) passed away peacefully in her 87th year. Beloved wife of the late Vratislav (Victor). Much loved mother of Eva (George) Joao of Carlisle, Irene (John) Kraus-Picado of Mountsberg, Linda Kraus of Carlisle, Sylvia Kraus of Toronto and Olga Kraus (Romeo D’Agostini) of Carlisle. Cherished grandmother of Lisa, Robert, Trevor, Mikaela, Kieran, Milan, Allegra, and Tesiana. Special thanks to Dr. Cindy Donaldson and the entire healthcare team that made it possible for her to be cared for at home. 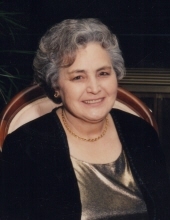 Visitation at Kitching, Steepe & Ludwig Funeral Home, 146 Mill St. N., Waterdown, on Tue., Mar. 1 from 2-4 p.m. and 7-9 p.m. The funeral service will be held on Wed., Mar. 2, 2016 at 11 a.m. Reception to follow in the Family Centre. If desired, expressions of sympathy flowers or donations to the Hamilton S.P.C.A would be sincerely appreciated by the family.